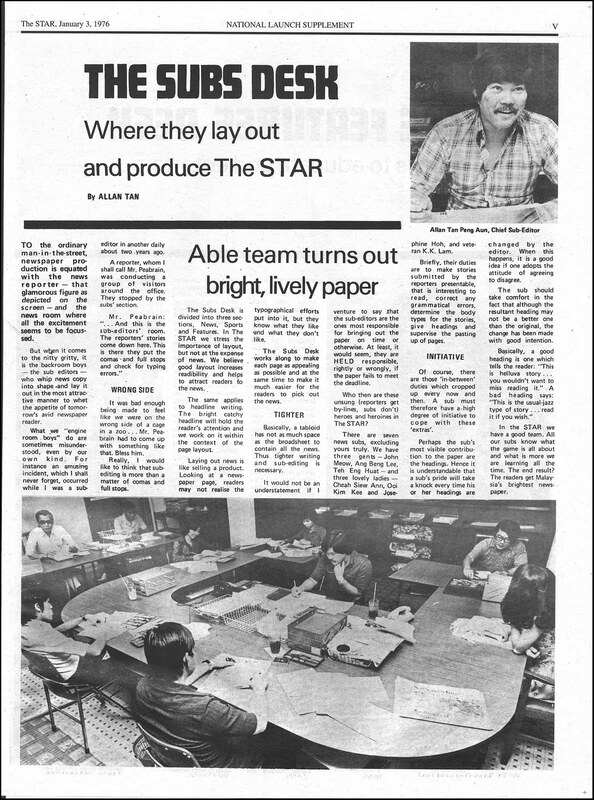 September 9, The Star (largest in terms of circulation) an English-language, tabloid-format newspaper in Malaysia turned 40. 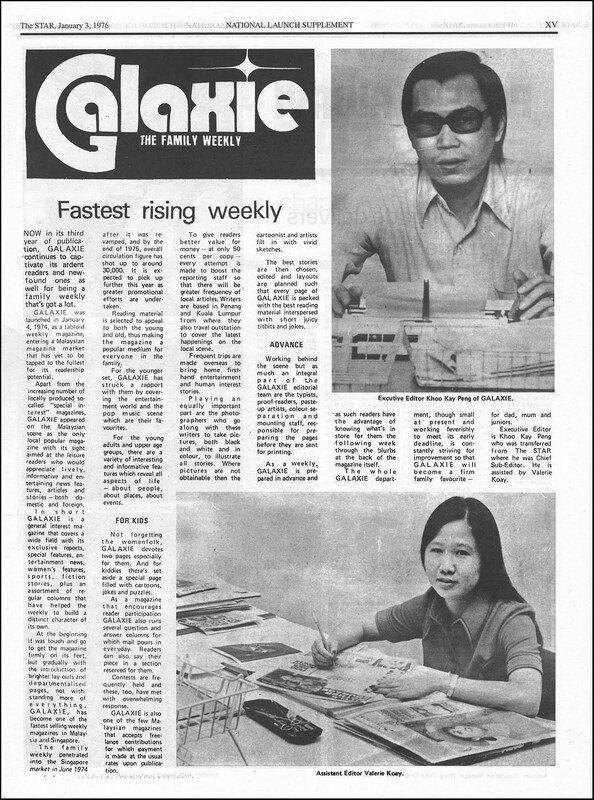 On that day the paper reprint the first copy of The Star (09-09-1971) and gave to those who attended the anniversary celebration. 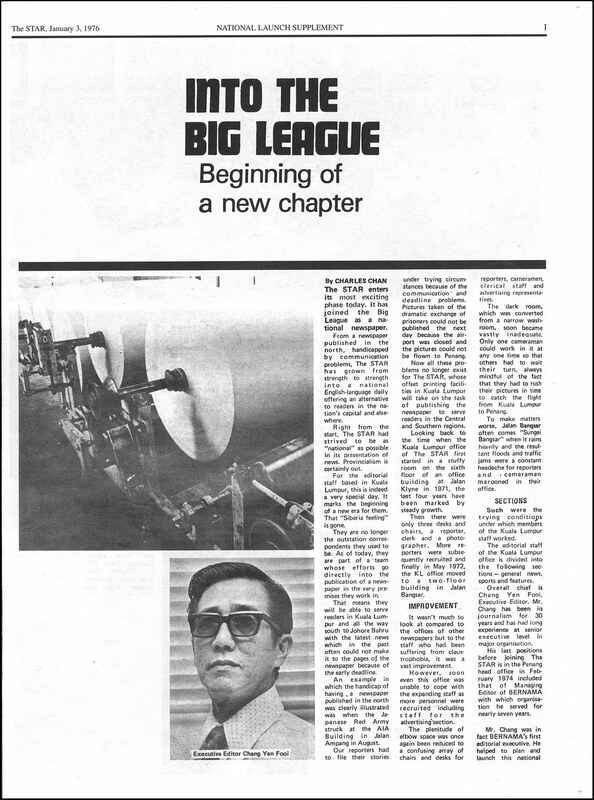 You are able to download this historical first issue in PDF format, here. 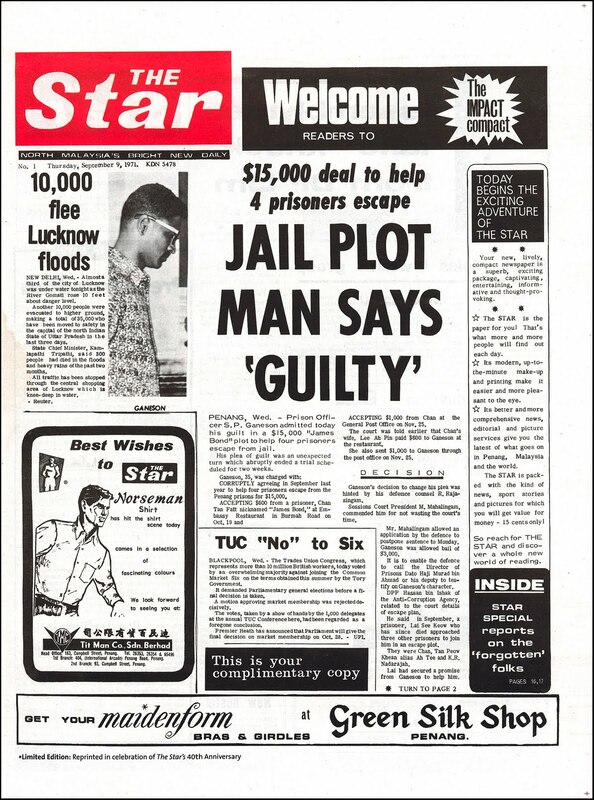 Within that first issue, The Star also reprint in full; the January 3, 1976; National Launch Supplement which show case the pioneers on that historical event! Thanks to young YC Meng who courier me a copy of the paper plus supplement, I was able to relive my precious memory! Thank you Meng! 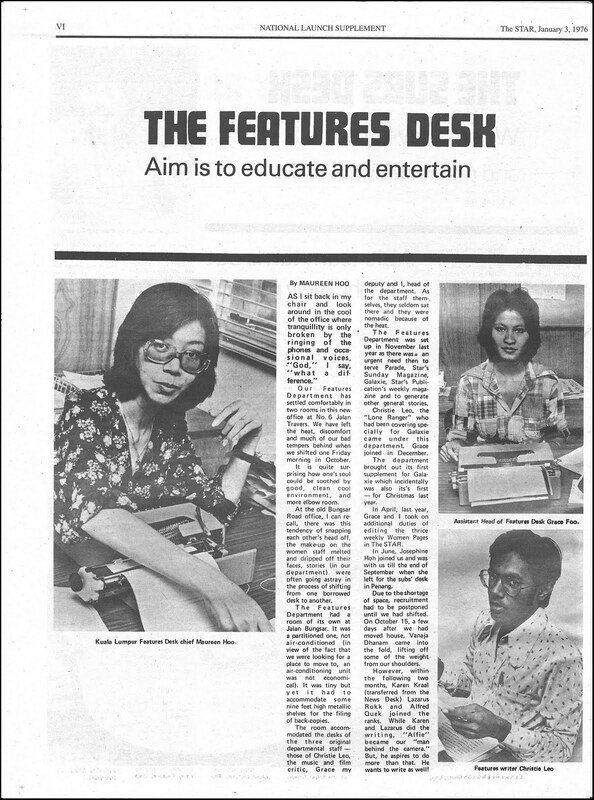 I am sure my friends and ex colleagues of the same era would like to read this supplement, as far as I know you cannot download or view it at The Star site. The full supplement was scanned by me in high resolution and down sized for the screen, you should be able to read the text comfortably. Here's to you, the pioneers! 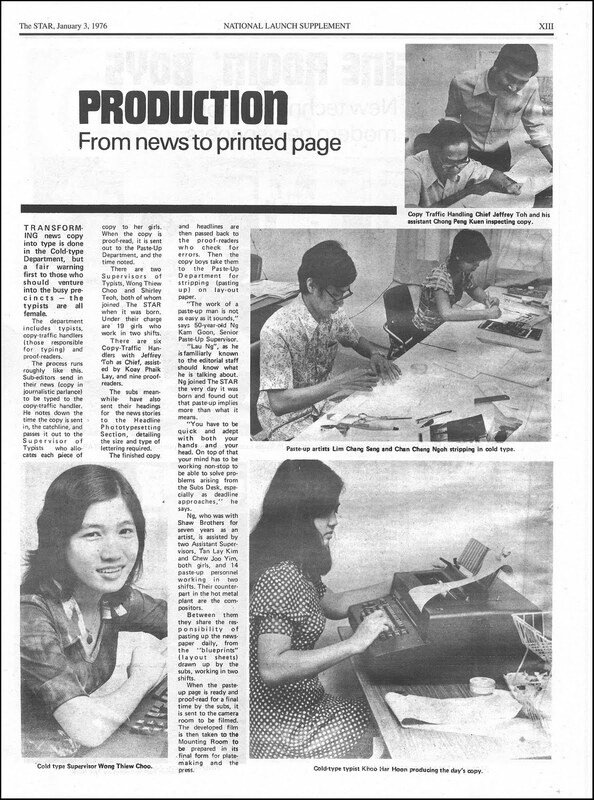 And most of all to K.S.Choong, one person without whom there will be no "People's Paper"! Comment from John Santiago, ex Star reporter and who I had the pleasure of meeting again after all these years! John (JJ) and his wife now resides in Auckland. Thanks John!! 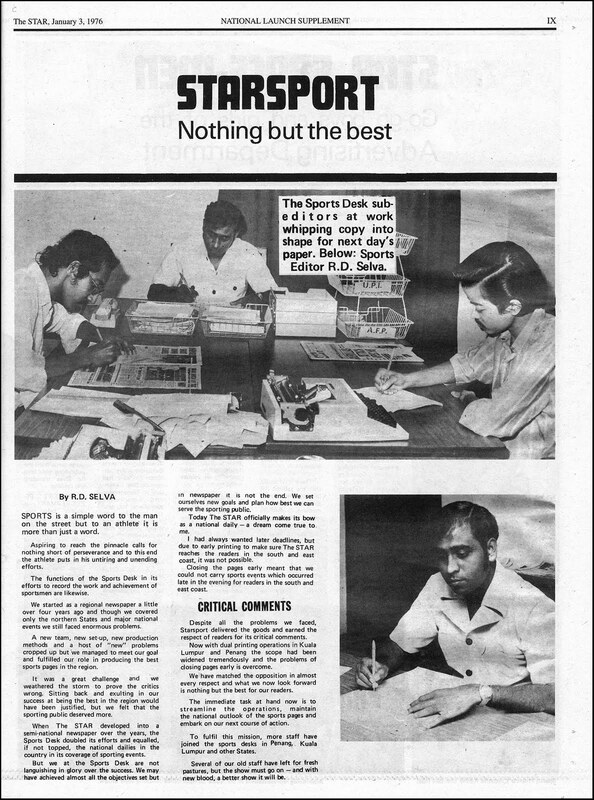 "First of all, CY, let me take the liberty to record my gratitude on behalf of all the Stardust fraternity to your enormous and selfless effort to reprint the first issue of the People's Paper and its national launch, thus taking us all down memory lane. 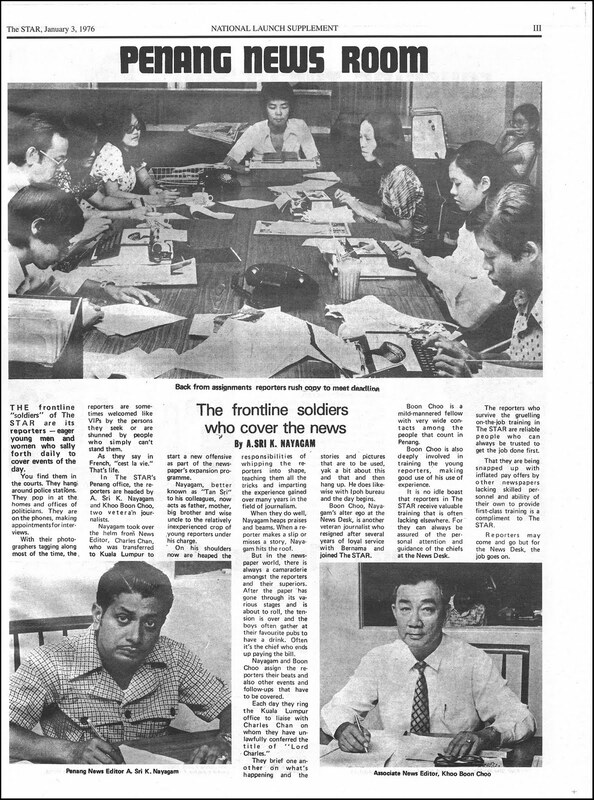 Although I was not one of that fortunate souls who can pride as one of the pioneers of The Star, I nevertheless had the privilege to be part of the team of some of these pioneers in later years. I missed out the national launch date by a few months. 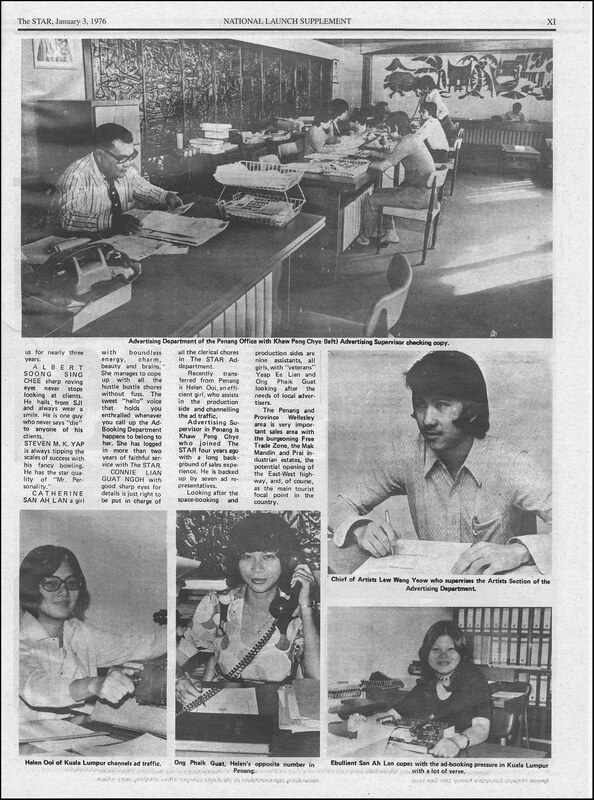 I joined The Star either in June or July of 1976. 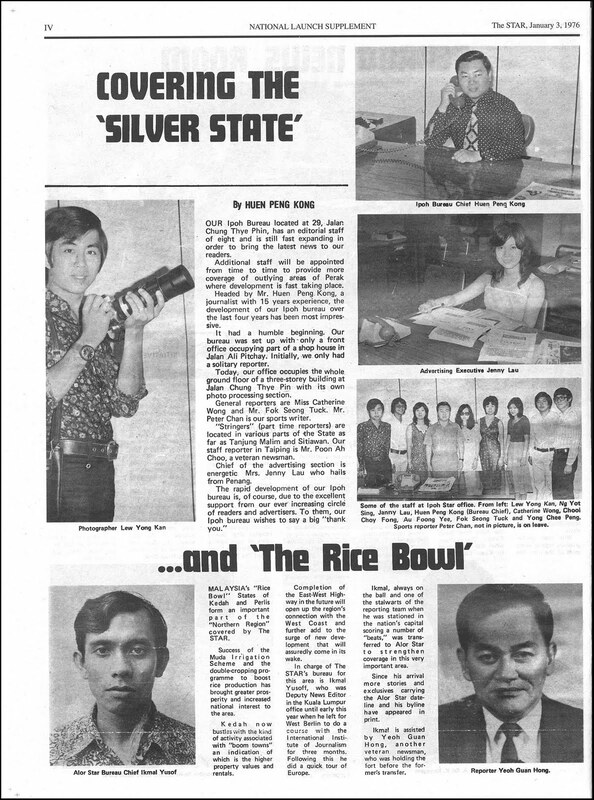 But I had the privilege of association with Chang Yen Fooi (who incidentally was in and out of The Star), my personal friend Thana Sekaran and my subs-desk colleague Teh Eng Huat. 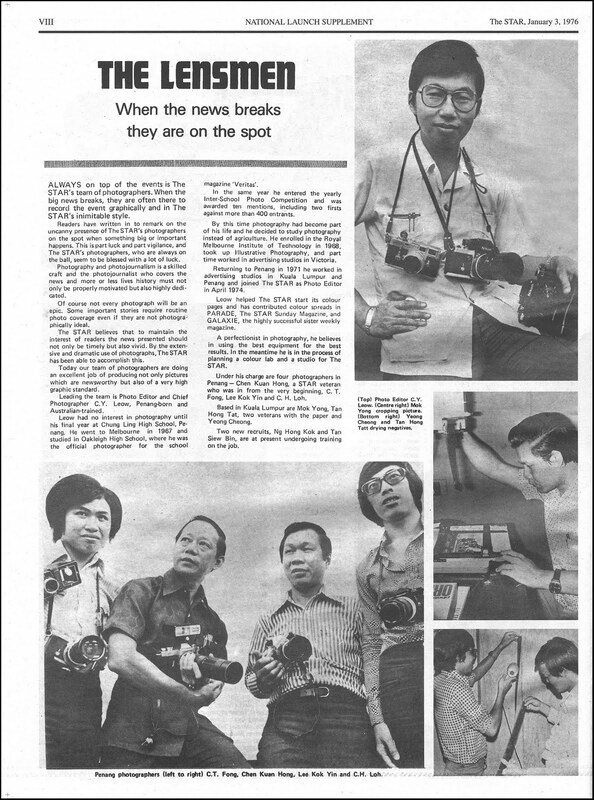 Apart from you, CY, the other lensmen I recognise are Mok, Loh and Hong Tatt. 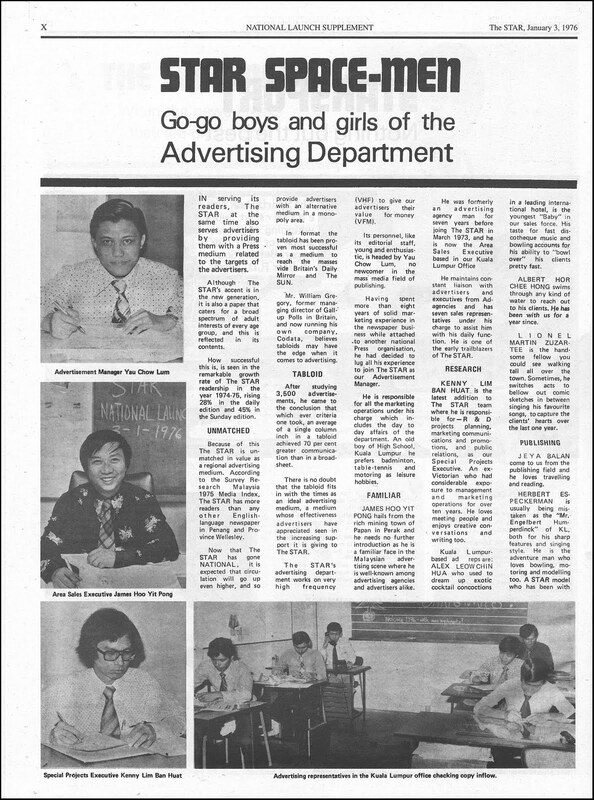 Sports editor R.D.Selva and Galaxie editor Khoo Kay Peng; the bubbly Ah Lan from the advertising, Jimmy and Shirley Ho from the admin are the other pioneers I had the privilege to be associated with. Maureen Hoo and Grace Foo are among the name recognitions I can associate with of my time. 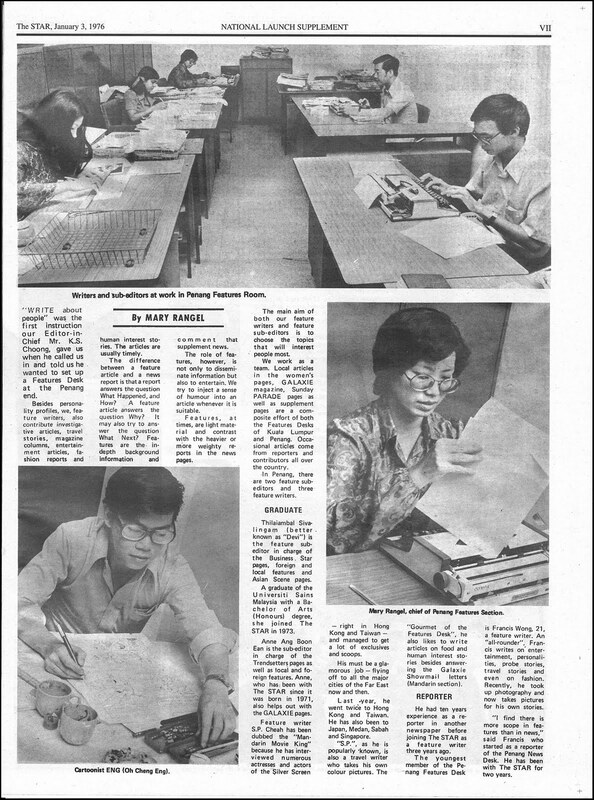 Although I did not have the opportunity to work with the then head of the Subs-Desk,Allan Tan, I fully agree with the sentiments he has expressed in his article about the sub-editors. 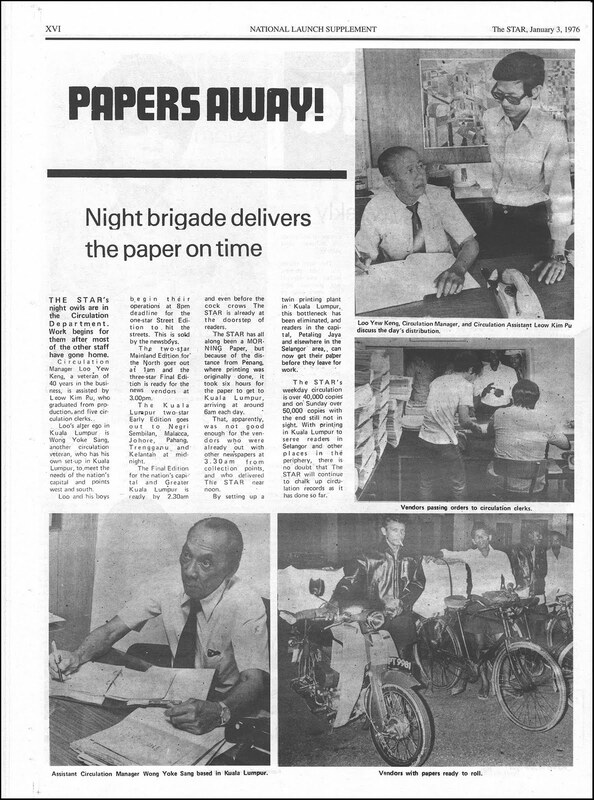 They are the ones who whip-up and shape-up the paper. Actually, in a manner, you can say that the buck stops at the Subs-Desk. Yes, it takes the news editors who determine the stories to chase for the day and assign the appropriate reporters to the task and does the initial re-writes, the reporters who produce the raw copies of the reports, the cameramen who provide the visuals that themselves "speak a thousand words". But, as Allan has noted, what the readers see and read are the end-product of the Subs. But they get no honours. There is no by-line for them. They are the unsung back-room boys. I loved reading Allan's recollection of the imbecile "Pea-brain" and his idiotic definition of the subs as ones who "put the comas and fullstops and check for typing errors.Among the pioneers I had the privilege of association with was A. Sri. 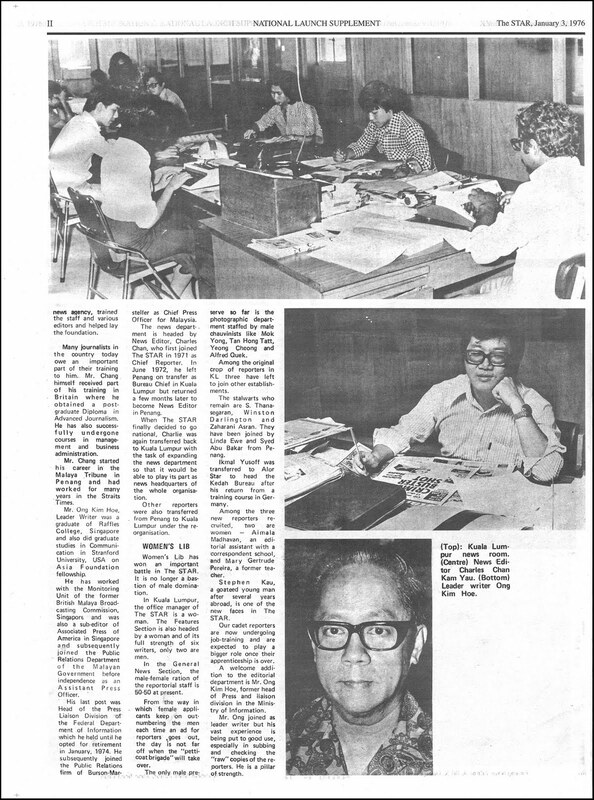 K. Nayagam, the very man who recruited me to the People's Paper. 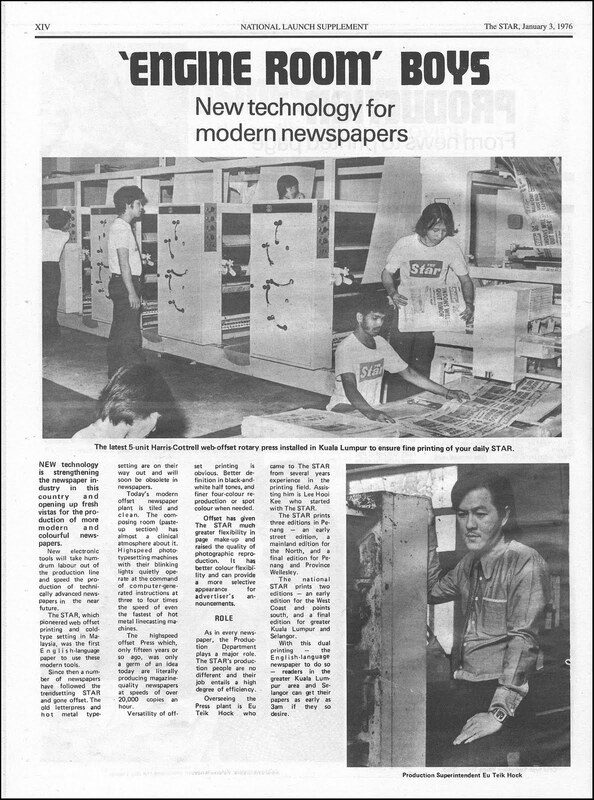 Also, how come the dark-room boys who produce the page negatives are missed out. 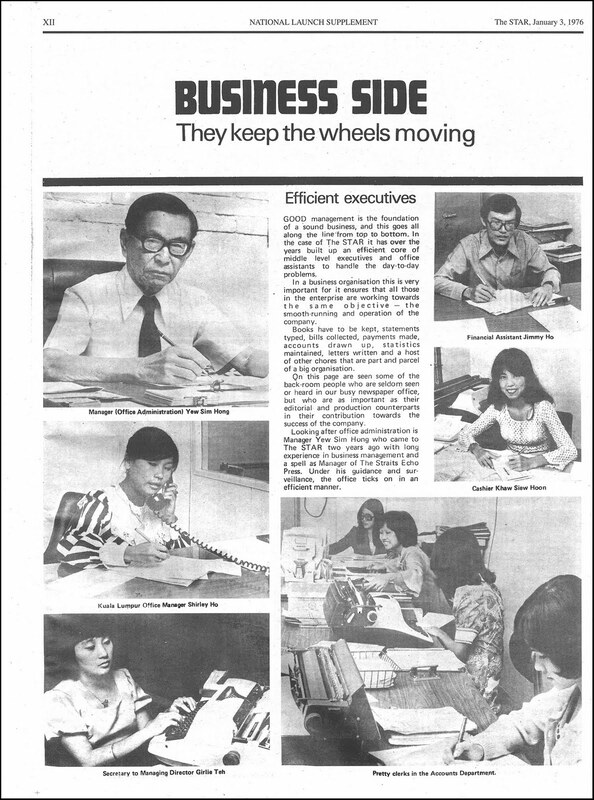 I still remember Giant Loo, who succeeded Wan Chow as head of that section. Also not featured is the Library section! Thanks CY once again for this great effort. We all owe you one!"